Opening weekend $93,972 on 4 screens. Nominated for Best Picture; Best Actor-Tom Wilkinson; Best Actress-Sissy Spacek; Best Supporting Actress-Marisa Tomei; Best Screenplay. At the start of In the Bedroom, it looks like the film will take a fairly standard path along the lines of flicks like Ordinary People. The movie introduces us to an apparently normal Maine family. The Fowler clan includes patriarch doctor Matt (Tom Wilkinson), music teacher mother Ruth (Sissy Spacek), and college student son Frank (Nick Stahl). 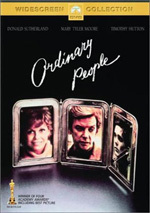 The most prominent issue they confront relates to Frank�s romance with older single mother Natalie Strout (Marisa Tomei), of which Ruth clearly disapproves. Frank contends it�s nothing more than a summer fling, but he obviously feels a stronger affection toward Natalie, and he considers taking time off from school and working as a fisherman. A complication occurs due to Natalie�s abusive and controlling ex Richard (William Mapother). He continues to harass Natalie, and he eventually shoots and kills Frank. Most of In the Bedroom deals with the aftermath of this event. We watch as Richard goes to court but the legal machinery works too slowly for the Fowlers. They also become frustrated because it looks like Richard might be tried on a lesser charge like manslaughter; he claims he accidentally shot Frank, though it seems clear that wasn�t the case. After a while, Matt tries to figure out his own solutions for the problem, especially since Richard is out on bail and remains in the area. My synopsis probably makes In the Bedroom sound fairly plot-oriented, but it�s not. I regard that as a good thing, for it depicts the events in a very naturalistic manner. Bedroom comes as the first feature film from director Todd Field. Better known as an actor, he enjoyed probably his most prominent role as the piano player in Eyes Wide Shut, and he also played small parts in Jan de Bont flicks such as Twister and The Haunting. Given that background, I had no reason to expect much from Field as a director. However, he provides a nicely subdued and understated touch behind the camera. Early on, it looks like Field might try to overdo some elements; for example, we quickly learn the origin of the movie�s title, and this explanation of the term �in the bedroom� feels a little too convenient considering what takes place in the rest of the film. Such moments pass quickly, however, and Field lets the remainder of the story move at its own pace. Despite the heavy-duty subject matter, he never forces things or pours on the histrionics. Instead, events are treated in a cool and believable manner, and that fact makes them all the more effective. Had the film consistently indulged in overwrought hysterics, it would become tiresome and unrealistic, but the coldness allows the pain to seep through all the more clearly. It also helps that the cast offers uniformly excellent performances. Bedroom earned three Oscar nominations in the acting categories, and all seem deserved. Both Wilkinson and Spacek bring uncommon power to their roles. Without showy mannerisms or outbursts, they communicate their agony in believable ways, and the tension between them becomes nearly unbearable. To me, this is what acting should be: realism stripped of the excessive scenery chewing that often passes for talent. Overall, In the Bedroom provides one of the more powerful and compelling domestic dramas I�ve seen. The film eschews melodrama and theatrics and instead favors reserved strength and bottled emotions. Buoyed by excellent performances and a refreshing lack of obvious moralizing, In the Bedroom offers a haunting and vivid piece. In the Bedroom appears in an aspect ratio of approximately 2.35:1 on this single-sided, dual-layered DVD; the image has been enhanced for 16X9 televisions. Though not an excellent presentation, Bedroom usually offered a solid visual experience. Sharpness seemed fine for the most part. Some wider shots displayed a wee bit of softness, but those concerns remained modest. Usually the movie came across as crisp and well defined. Jagged edges and moir� effects caused no concerns, but I did notice a slight amount of light edge enhancement. As for print flaws, the movie demonstrated a few bits of grit and some speckles, but nothing major marred the image. Colors and contrast seemed a little off much of the time. The hues appeared fairly cool and the movie exhibited a moderately gauzy look that may have been intentional, though it was hard to tell. I could understand the desaturation if it occurred solely after Frank�s death, but these issues appeared throughout the whole film, which meant they made less sense. The movie looked a little too bright at times as well. Some moderately poor �day for night� photography appeared toward the end, but shadows otherwise seemed fine. Overall, In the Bedroom generally presented a positive image, but these oddly flat elements led me to lower my grade to a �B�. One wouldn�t expect a slam-bang soundtrack from a quiet drama like In the Bedroom, and the film�s Dolby Digital 5.1 audio won�t surprise anyone. The mix displayed a very heavy orientation toward the front channels. Music showed decent stereo imaging, and effects created a fair sense of ambience, but not much else occurred. The surrounds added very light reinforcement of those elements but didn�t do anything very substantial for the most part. Audio quality seemed fine. Dialogue appeared natural and warm, with no signs of edginess or problems related to intelligibility. Effects usually played a modest role, but they remained distinct and accurate and lacked distortion. Music stayed in the same stark vein as the other elements, and the score seemed clear and bright, with acceptable range and fidelity. The audio of In the Bedroom appeared appropriately spare. To my surprise, In the Bedroom includes virtually no supplements. The DVD provides a mix of ads in the Sneak Peeks domain. There we find promos for Baran, Behind the Sun, Italian For Beginners, Gangs of New York and Full Frontal. Otherwise, Bedroom comes totally devoid of extras. This seems almost shocking given the moderately high stature of the film. A brand-new flick gets nominated for five Oscars - all in prominent categories like Best Picture - but offers absolutely no supplements about the film? I examined the 25 BP-nominated movies that have come out during the �DVD era� - ones were released from 1997 to date. Only a handful offered so few extras, and none of them involved flicks from 1999 to the present. The last BP nominee this feature-free was 1998�s The Thin Red Line, and even it included some extras in its original release, though the 2001 reissue linked above offered nothing. However, expectations for DVD releases in 1999 were very different than they are in 2002, which makes In the Bedroom such a puzzling case. I know that some of the BP nominees skimp on extras because their directors don�t like them. That factor affected Thin Red Line as well as flicks like The Insider and The Green Mile. Does Bedroom omit supplements due to director desires? I have no idea, but the absence of features seems startling. Despite that, I still would recommend In the Bedroom because the film itself offers a fine piece of work. The movie tells a sad tale and does so in a sublime and elegantly stark manner. Highlighted by consistently excellent acting, the film offers a moving and impressive experience. Picture quality seems a little off but remains solid for the most part, and the subdued soundtrack fits the movie. The absolute lack of supplements remains odd, though. That factor - plus a list price of almost $30, which seems rather high for a bare-bones affair while MGM releases special editions for less than $20 - probably places In the Bedroom in the rental category, but the movie merits your attention nonetheless.